Is anyone else noticed a huge increase in their taxes for 2018? I have been getting substantial tax refunds for the last 30 plus years, consistently. Last year was no exception. So in 2018 I increased my 401K contributions by 10% and I got a 2% pay increase as well with no change in filing status. One would think I would have done better this year and got at least an equal tax refund to last year's. But behold I started working my 2018 taxes in Turbo tax this week and I see a 20K increase in my taxable income. This change is the most monstrous change I have ever seen. Is this a result of the new tax laws? This increase has resulted in me actually have to pay taxes this year. So I went from getting a 3K plus refund last year to this. So again I ask again, is anyone else seeing this much change or is Turbo Tax just wrong? Depending on your circumstances the tax changes may have affected your refund. As suggested, do compare your prior year return to this years. Exemptions are the biggest area that individuals will feel the change. Truck drivers working for a single company will also notice a difference. I did a preliminary pass on my 2018 taxes this weekend using TurboTax and found the exact same thing. My taxes went up by approx. 300%! Very little has changed with my income the past 2 years. Last year I got a COLA raise and that's about it, so certainly my taxes should not have jumped so considerably. Nor did I change my withholding. It appears that with the tax "cuts" that were enacted last year, since I did not change my withholding, those cuts were not cuts at all but LOANS using fuzzy math! Very disappointing and I will be voting accordingly. How many people did you claim last year? Last year I claimed 3 (3 people in household), same as I have every other year going back as far as I can remember.... the only thing that changed from 2017 to 2018 for me is a 2.7% raise and these goofy tax law changes!! Yes, i'm seeing the same thing. I own a house and I am married we both take 1 deduction (claiming ourselves) . We both received raises this year but nothing major. We both contributed a signification amount to our 401K and/or 403B. We went from receiving a $3K plus refund last year to owing just under $3K this year. This tax reform is actually screwing me and I'm sure the rest of the middle class. Should I go back to claiming zero and go back to claiming single instead of married? This is just crazy to me. I thought this tax reform was supposed to help the middle class not hurt us. I won't be filing my tax return until the April 15th deadline because now I have to come up with uncle sam's money. 2) use the coupons in turbo tax to send Uncle Sam a check for $750 on each of the 4 due dates over the course of the next year. 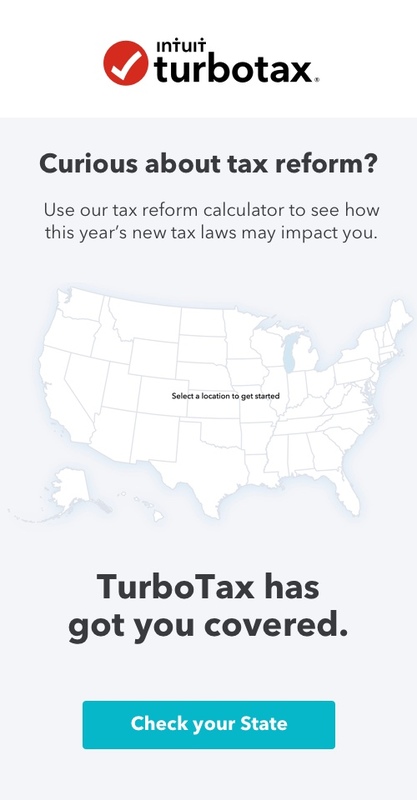 out of curiosity, are you in CA or the Northeast where the 'SALT' (state and local taxes) limit of $10,000 were expected to have the biggest impact? I'm in Virginia where are taxes are high but not that high. Otherwise, my bill would most certainly be a lot worse.